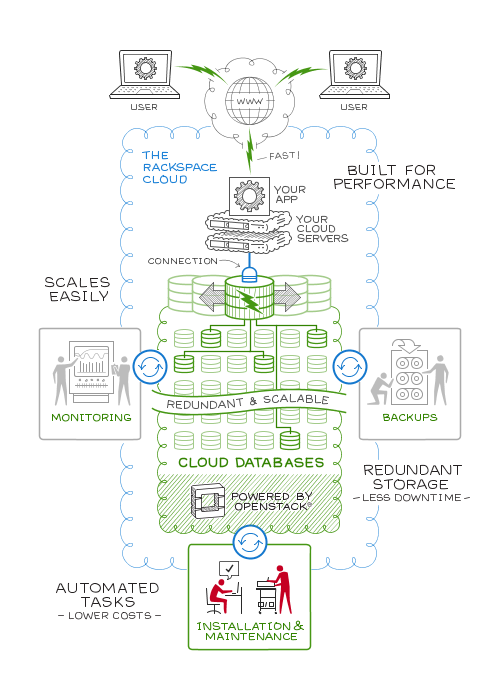 The Rackspace Cloud Databases service powered by OpenStack enables developers to easily provision database instances of varying virtual resource sizes without the need to maintain and/or update the database engine through a simple Representational State Transfer (REST) web service interface. Rackspace recommends that Cloud Databases users back up their data using backups in Cloud Databases. This guide is intended to assist software developers who want to develop applications by using the REST application programming interface (API) for the Cloud Databases service. You can also use Cloud Databases from the Cloud Control Panel.